Born in Okerenko, south-west of Warri in 1969, Tompolo, of Nigeria's royal house of Okerenkoko, attended Okepopo Primary School, where he learned to speak Itsekiri, and later the Warri Comprehensive College, leaving in 1993. He joined the struggle against environmental damage wrought by the oil companies in the Delta and led the Federated Niger Delta Ijaw Communities (FNDIC), which was at the centre of an uprising in 2003 that shut down 40% of Nigeria's oil by attacks – mainly against Chevron of the United States. The Nigerian military's hunt for High Chief Government Ekpemupolo, alias Tompolo, and the fight against the Movement for the Emancipation of the Niger Delta has turned the region into a military camp. In contrast to the furore his military campaign has provoked, Tompolo is quiet and unassuming. In his late-thirties, Tompolo is extremely self conscious: he is far less educated than some of MEND's sophisticated operators, who have delighted in getting their story across to foreign journalists. Tompolo's military career began during the Warri crisis, the 1997 war between Ijaws and Itsekiris which started after General Sani Abacha's government had moved the headquarters of a local government it had created and placed in the Ijaw part of Warri to an Itsekiri area of the city. Tompolo earned a reputation for bravery and ruthlessness. 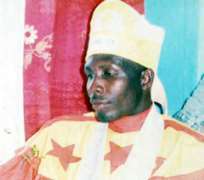 After the fighting ended, threats to his life forced Tompolo to flee Warri and move to Oporoza, in Gbaramatu Kingdom. There, Tompolo and his fighters decided to lead a military campaign against Shell oil company, accusing it of environmental despoliation and exploitation; the operation turned into a protection racket, with Shell making payments to Tompolo and his associates. Impressed by this, the Governors in Delta and Bayelsa States hired Tompolo to assist with some political enforcement. He was heavily involved in the war against Itsekiri neighbours of Bayelsa ex-Governor Diepreye Alamieyeseigha. Politicians and senior military officers also paid Tompolo to protect their illegal bunkering operations. He is reported as having a house in South Africa, and often entertains visits from the Delta governors and Vice-President Goodluck Jonathan. Tompolo is much feared among the Ijaw. His reputation has been boosted by his worship of Egbesu, an ancient Ijaw god of war, revived to symbolise the struggle against the federal government and oil companies. Followers of the god believe he gives protection from death and capture during war; Tompolo is in the inner sanctum of Egbesu warriors and an exponent of their elaborate sacrifices and rituals to the deity.